The url is right, IYSWIM. Yeah, that looks like test data, it's been there since before the event, and is being replaced with the real data as and when it becomes available. So now I've met a former unfaired recumbent world champ woman (French, now just returned from cycletouring) and the current silver medalist unfaired etc. Good work Kim. Yeah, congratulations Kim. Unfortunately, I didn't make it down there this weekend - too busy with other stuff (eg repairing windows, goddamit) - and it sounds like I missed a treat. O hai! I am made ov Win! Slightly disappointed not to see any pics ov Teh Crimson Hay-Bailer or Pat Pending's Convertacar. You've captured just about everything else . . .
A podium even Flatus can be envious of. I take it that Kim is the one in the geek black T’ ? Indeed. That T-shirt was standard-issue. Well done Kim Nice pottery. Battle Mountain next year ? Though I an informed that the luckless Matthias König* is going this year to ride a bike built by Hans van Vugt. And if he does well, to get properly serious about it for 2019. * self-digesting front spokes in the 1-Hour, attempting to follow Steve Slade through a bike-only sized gap in the 15 minute one and ending up on the grass. looks like a Jelcz 43 bus. I expect the Thing is faster but I'm far from certain which makes a better cucumber sandwich. Thing 1 had a teeny camera mounted above the cockpit, Improvement of Forward Vision for the use of. Thing 2 did not. Stationed, as i was, on the outside of a bend, this meant on a couple of occasions that Thing 2 got closer than is perhaps comfortable, steering in what looked like "ooh, there's the edge of the track, left hand down a bit" stylee. 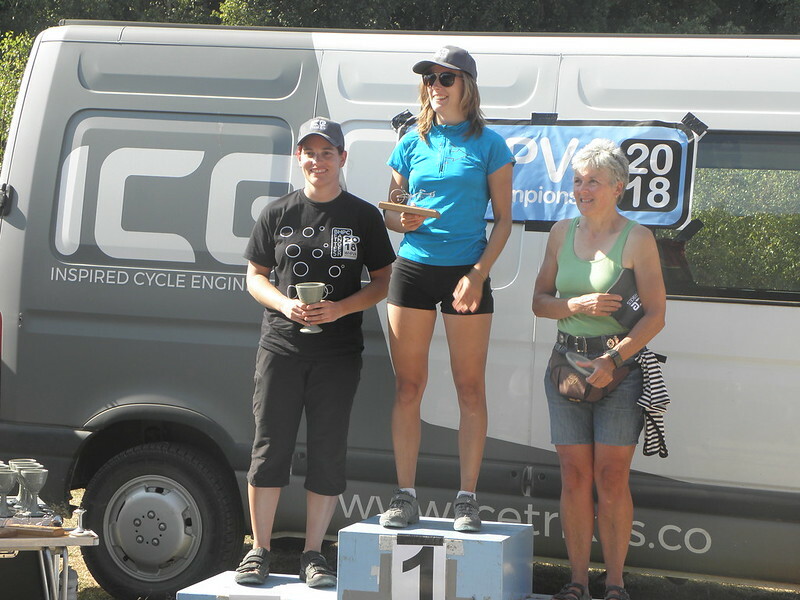 I was about to enquire if the winner had been handed a model of an upwrong bicycle but closer investigation of the photo reveals that it is in fact a recumbent. Ms Brönnimann doesn't seem to have an awful lot of shin clearance under her bars. Or is that a trick of the camera angle? These things can get a bit marginal. I remember Simon "Trigger" Thompson planing the skin off his shins with his forward-facing race number in the Hour at the 1990 Europeans. He very sensibly took up long-distance mountain bike racing not long after. This is what champions do. Blow their nose while riding very fast. Note aerodynamic hair acting as vortex shedder. A very fast Charles Henry, knackered. 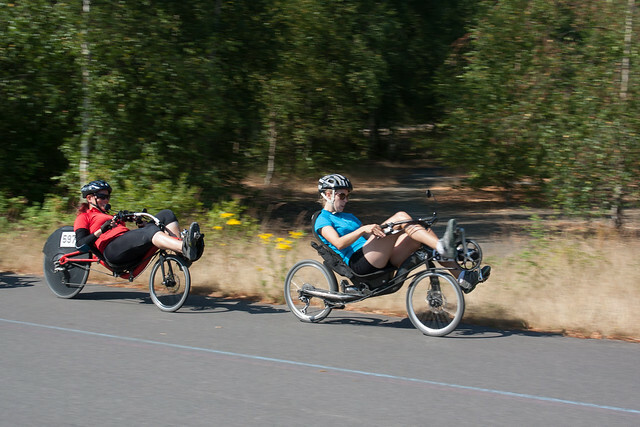 I like that there gnuprite trikes and even bikes mixed in there. And a bloke racing in a civilian button-up shirt-style shirt. In the interests of accuracy, I was scraping bits of sweat-drowned beastie from somewhere under my glasses, rather than actually blowing my nose. On a related note, if you're going to draft a high-racer, you've got to watch out for snot-rockets. DAHIKT. Logically you'd expect some sort of small fly, but it's entirely possible that one of the millions ants from the camping field wasteland sneaked in under my helmet. If that's the guy on the Scorpion, it's because his faster machine was out of action for mechanical reasons, so he decided to bring the Vorsprung Durch HPVelotechnik Panzerliegedreirad and a Hawaiian shirt and generally not take things too seriously. 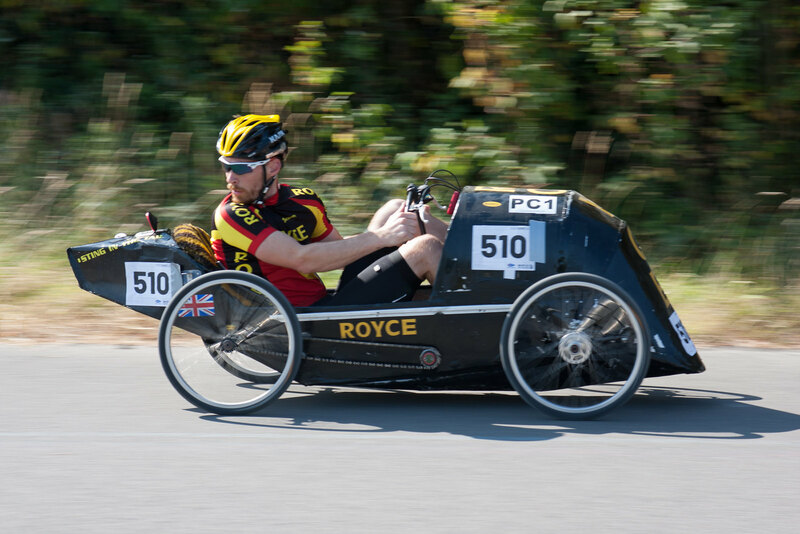 The great thing about these events is that anything that's human powered and meets the safety rules (which are mostly about brakes, magic hats and stabby bits) can come and play. BHPC mandate majic plastic bonnets? Shame. They're usually a condition of the use of the tracks, so I assume they require them for consistency as much as arse-covering. 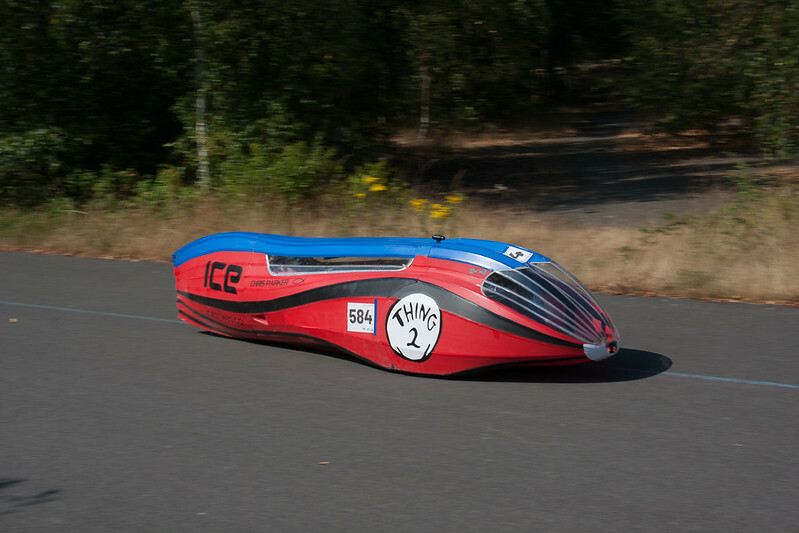 For the world championships they additionally enforced a standards-compliant helmet requirement for those in fully-enclosed machines - normally anything that prevents you bumping your head in a crash is permitted. In practical terms, helmets make a useful place to attach the RFID tags to something that's neither metal nor carbon fibre at a mostly-consistent height, and can function as an aerodynamic fairing for the head. They make more noise about the more significant safety benefits of chainring guards, mirrors, and elbow pads. To be fair, this is the sort of situation where helmets are potentially worthwhile, so I don't mind wearing one (as long as there aren't ants in it). I'm already wearing mitts, elbow pads, non-sandal shoes and older shorts that I don't mind too much if they get torn. That usefully stays with the rider if they swap machines mid-race due to a mechanical.